In the latest video for Wild West Online, we finally get a decent look at the forthcoming Red Dead Redemption-alike. In it, a criminal is hunted down and killed brought to justice. If you like your gaming massively multiplayer, check out our list of the best free MMOs. Back in May, an image was posted to the GTA Forums that looked a whole lot like Red Dead Redemption. Showinga frontier town full of horses and men in cowboy hats, the internet started pulling it apart to prove its veracity. In time, developers 612 Games came forward to say it was actually a shot of their upcoming Wild West MMO – which uses the image as a kind of teaser. 612 Games originally planned to fund Wild West Online through a Kickstarter campaign but the interest in the leaked image convinced fence-sitting investors to pony up the rest of the money for the developer to finish the game without looking for money from fans. Since it was first revealed, we hadn’t seen or heard much about Wild West Online. However, a new video of the game shows five minutes of it in action. While the setting has drawn comparison to Red Dead Redemption (and it certainly seems timed to release as close to Red Dead Redemption 2 as it can), to me the game looks more like Skyrim. For starters, it’s played in first-person, but also one of the first actions in the video is going into a saloon’s backroom to loot anything not nailed down. While there are NPC characters in Wild West Online a lot of the action will stem from how players behave. For instance, we’re told in the video that if the player had been spotted taking the whisky from the back of the saloon then they’d have gained a bad reputation. Let that get bad enough and you’ll find your face on the wanted board in the Sheriff’s building. From there, other players can then take your bounty and start hunting you. 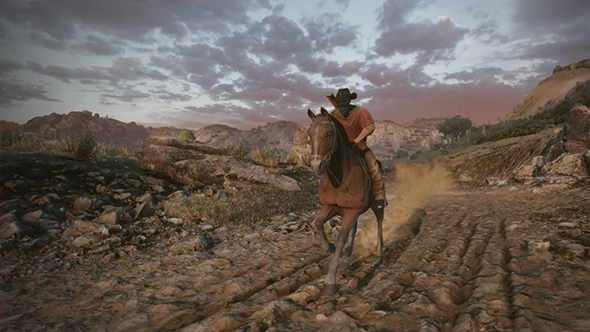 The systems on show in the Wild West Online video are intriguing – the developers are hinting at a world with a self-sustainingloop of players creating and completing jobs – but the game does look a little spotty, with some awkward animations, missing menu screens, and clunky shooting. It’s way too soon to judge the game fairly but I do want to see more.